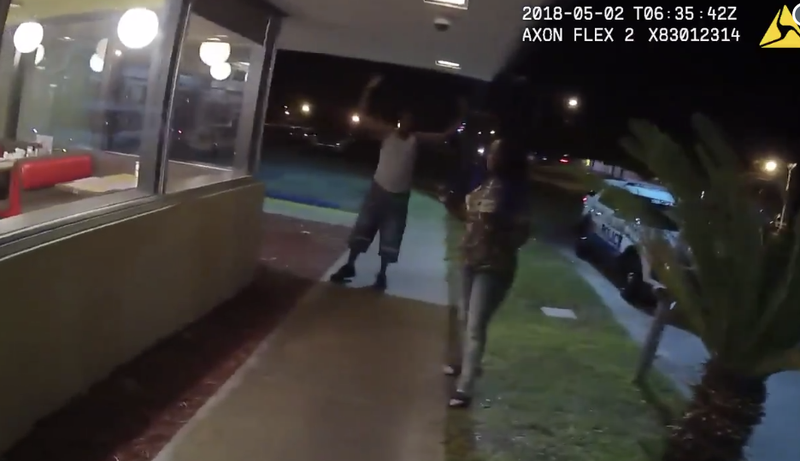 Donald Copeland can be seen with his hands up in police bodycam footage as he and a woman, identified by authorities as Ms. Hart, try to tell police their side of the story during an incident involving the cost of orange juice at a Fort Walton Beach, Fla., Waffle House. Waffle House is back under intense scrutiny after an employee called the police on a black couple who wanted their bill explained to them because of a dispute over the cost of some orange juice. The employee even went so far as to insist that police officers press charges against the couple if they refused to pay for the food they hadn’t yet received, mind you ... all over a $1.50 up-charge on orange juice. And we all know what happens when police are called on black people. In this case, the couple ended up with Tasers pointed at them, and they were even placed in handcuffs before they ultimately coughed up the money and promised to never go back to the Waffle House in Fort Walton Beach, Fla., again. According to The State, the incident unfolded at the Fort Walton Beach Waffle House on May 2. Cellphone footage taken by the couple and bodycam footage from a police officer show what happened during the encounter, which has now gone viral online. The couple, identified in a police event report as Donald Copeland and Ms. Hart, had placed a to-go order at the Waffle House at around 1 a.m., but when they saw the bill, they started to question some of the charges. The couple pointed out that the menu listed the orange juice they ordered as being $1, but they had been charged $2.50 on the bill. The couple argued with employees at the Waffle House about the extra charge and refused to pay the extra $1.50. Mind you, at this point, video footage shows, the couple had just been demanding clarification about the bill. They hadn’t eaten and hadn’t even received their food. The couple try to explain their stance to the police. Hart told The State that at that point, another officer, who was out of view of the camera, pulled out a Taser as Copeland approached. “We ordered our food; we’re waiting for them to charge us right,” Hart counters. Officers continue to insist that the couple leave the restaurant, and Copeland begins to record on his cellphone before handing the device over to Hart to continue filming as he walks out of the restaurant with his hands raised over his head. At one point, the same officer asks employees if they want to press charges, before he remove his handcuffs from his belt and takes out his Taser, pointing it at Copeland. The couple were later released from police custody without criminal charges after they agreed to pay the bill and not return to that particular Waffle House. A cell phone video has recently been circulating on Facebook regarding an incident that occurred at a local restaurant on May 2nd, 2018. Our officers responded to 318 Miracle Strip Parkway, SW, at 0129 hours in reference to a disorderly incident between staff and a customer. So we feel it is important to set the record straight and have attached a link below of the officer’s body worn camera, where citizens can view the video in its entirety. The Fort Walton Beach Police Department conducted a full review of the incident and the actions our officers took that evening. Video from the officer’s body worn camera was reviewed in its entirety and conveyed our officers followed proper protocol when dealing with violations involving Florida State Statues [sic]. The cell phone video being shared only shows a small part of the incident and does not include that the individuals detained were released after the situation calmed and the bill in question was satisfied - which is what the officers were trying to achieve from the beginning. We met with other interested parties in regard to this matter and all parties involved determined that while there was no misconduct of the officers that the situation could have been handled differently by both parties involved. The Fort Walton Beach Police Department strives to provide superior police services to all citizens and uses opportunities such as this to learn and refine our interactions with the public. So after all of that is said and done, I really just have one question: Are we done with Waffle House yet?